Want to try your hand at the California sushi roll? 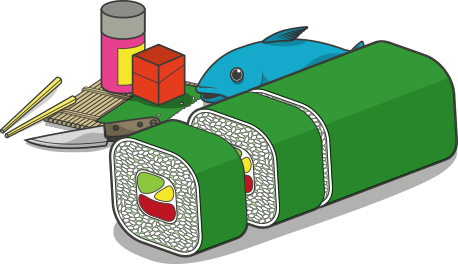 A classic example of modern, Japanese-American fusion, California sushi rolls are inherently popular because they contain no raw fish. Topped with Masago or Black sesame seeds, they’re also beautifully esthetic, making them a popular choice for dinner parties and buffets. Perhaps the ultimate allure of the California sushi roll is that it’s one of the easiest types of Uramaki (‘inside-out’ roll) to get to grips with – a great starting point for novices who want to improve upon their existing skills! Sesame seeds have somewhat lost their appeal in modern cooking due to their being devoid of flavor. In fact, the white seeds used to top baked goods and burgers are little more than empty kernels, which is why they have little ‘taste’ per se. Black sesame seeds, on the other hand, are bursting with flavor due to the hulls still being intact. Gently smoked over smoldering bamboo, Roland Smoked Sesame Seeds boast a richly earthy, nutty flavor, with delicate charcoal undertones that make them ideal as a sushi topping. Did you know sesame seeds are naturally high in calcium and protein? Though small, black sesame seeds are oil-rich, and boast a wealth of essential nutrients and vitamins. In Japan, they are commonly ground down to make healthy cooking oils and Gomashio. A dry condiment usually made from sea salt, a little sugar, and ground sesame seeds, it’s traditionally sprinkled atop plain rice or Onigiri to infuse the rice with flavor. If you’re not a fan of pungent condiments, but love getting creative with ingredients, Roland Smoked Sesame Seeds are a subtle alternative that go with just about everything!